Czech Fire Polish Round Beads are made from glass which is moulded or cut and then heated and polished at very high temperature to leave highly polished facets. Fire polished beads are a very popular type of glass bead which were first made 5 centuries ago to give the appearance of cut gemstones and a fraction of the cost. Offering great consistency and style at affordable pricing, Czech fire polished round beads with their shimmer and sparkle, are further enhanced by the wide range of available finishes: AB, lustre, silver linings, iris, metallic coatings, vacuum coatings and dual coats. 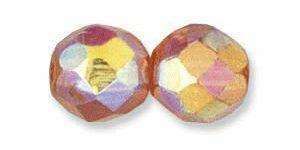 Crystals and Ice Bead Shop stocks a wide range of 2mm, 3mm, 4mm, 6mm and 8mm Fire Polish round beads, together with Rosebud beads and Faceted Donut beads.